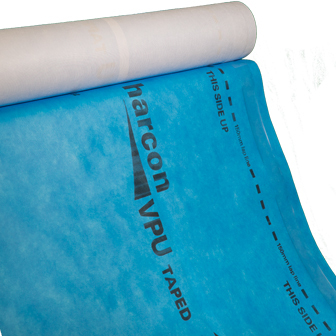 Harcon VPU vapour permeable underlay is available taped to one side of the membrane for ease of installation, in 2 weights options of 102g and 125g and in two widths of 1000mm and 1500mm. Ariel’s single taped underlays are used to seal horizontal laps, contributing to increased thermal efficiency by reducing air infiltration and convective heat loss, whilst improving wind uplift performance. The vpu membrane has a 3 layer composite structure with the vapour permeable film bonded between two layers of non-woven polypropylene.